The accommodation is located in the upper part of small, charming town of Omiš, known for its specific surroundings, a mixture of marine, riverine and mountain landscape. The apartment is set on top floor of a cascade house, and is completely independent from the rest of the house. Spreading on three levels and thoughtfully decorated blending modern and rustic, the apartment provides comfort and dash of Dalmatian living style at the same time. 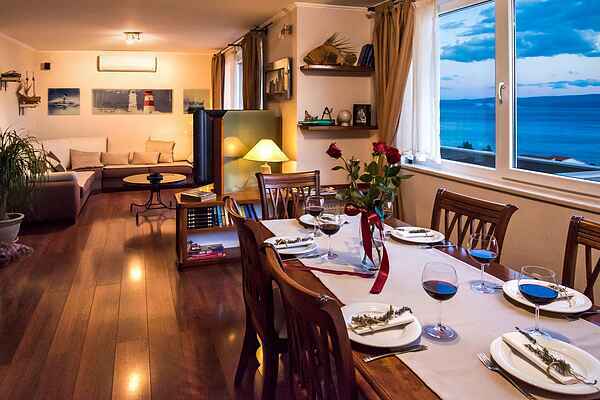 The whole apartment is south facing and the sea view is available from all its rooms. The terrace, with the dining table and stone BBQ, also benefiting of wonderful view, is grate for dining and relaxing. The apartment is an easy 15 minutes’ walk from downtown Omiš (with lots of shops and restaurants), and 10 minutes’ walk from a grocery store. Right next to the house, there is a private stair to get directly to the beach. The stay in Omiš, gives opportunity to enjoy a lot of beautiful beaches in the Riviera or visits to central Dalmatian islands by boat excursions as well as choice of sports activities on the sea or on nearby river Cetina.